St. Patrick’s Day is such a fun holiday in the classroom! After all, who doesn’t love wearing green? 😉 Your students are so lucky to have you as a teacher, especially in the month of March when the theme is St. Patrick’s Day and everything lucky! 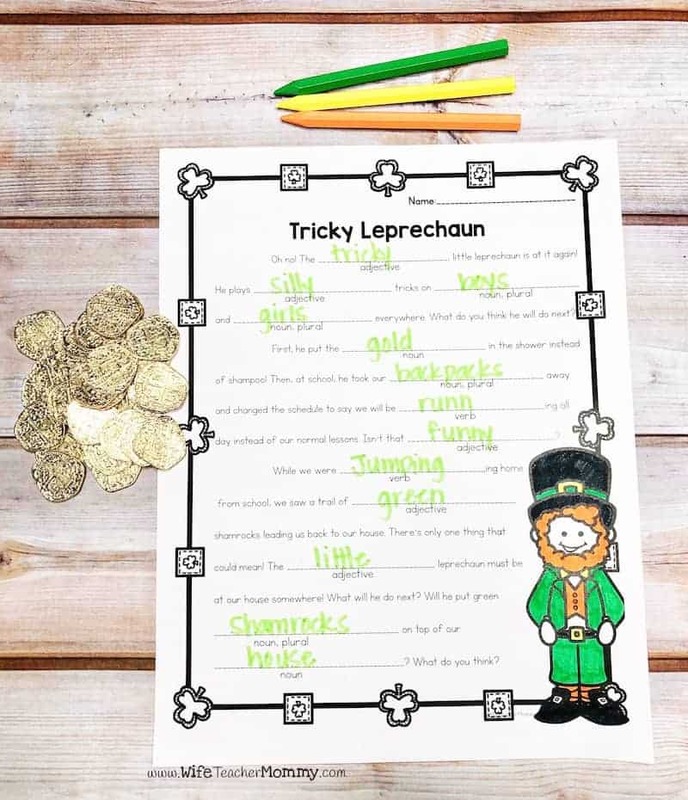 You can incorporate lucky leprechaun-esque activities in each content area. 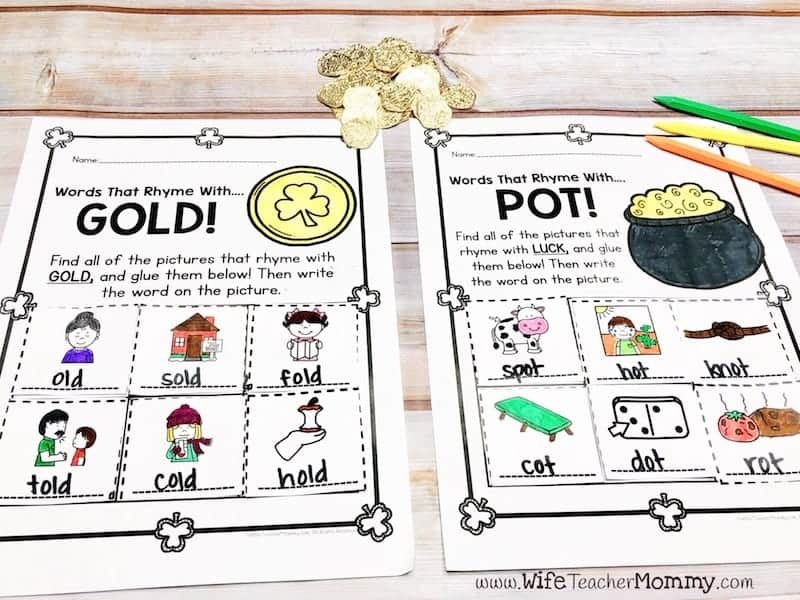 Here are a few St. Patrick’s Day teaching ideas kids will love! From math to writing St. Patrick’s Day activities, there is something for every content area. 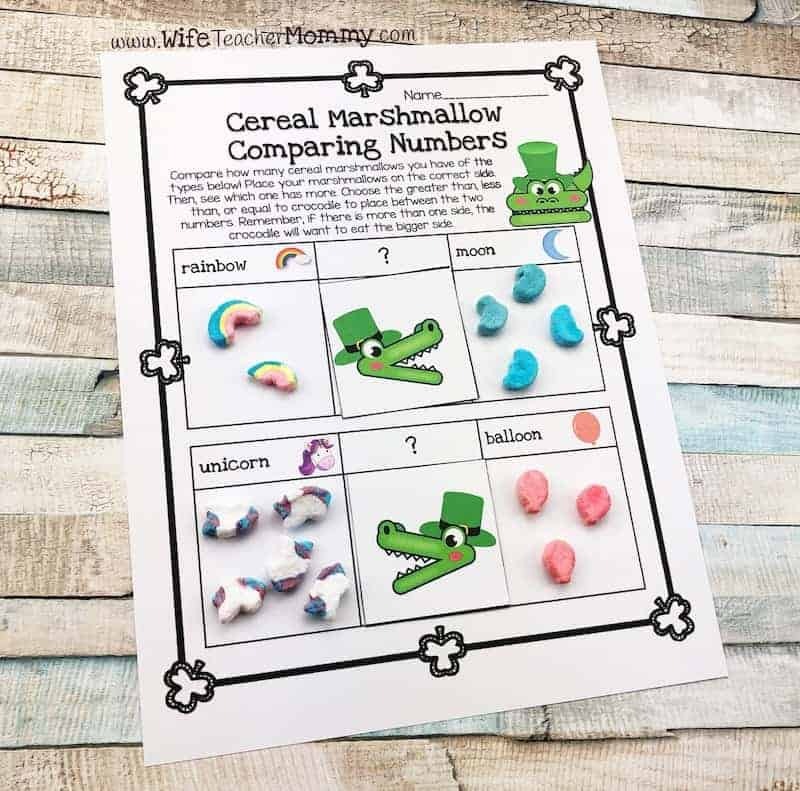 Count Your Lucky Charms with these Marshmallow St. Patrick’s Day Teaching Ideas! As if we need an excuse to buy Lucky Charms! Enjoy the sweet cereal along with these St. Patrick’s Day teaching ideas for math. Graphing marshmallows by color is a great way to get your children enjoying math while eating a tasty St. Patrick’s Day treat! 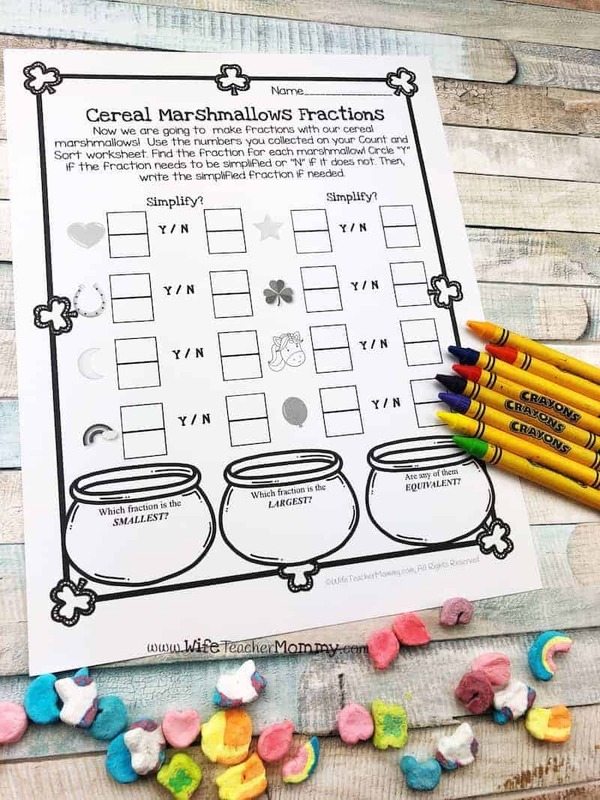 The cereal marshmallow activities pack for upper elementary (3-5) also comes with other fun-filled math and language arts activities incorporating these lucky treats. Pre-K-K cereal marshmallow activities and 1st-2nd Grade cereal marshmallow activities are also available! If picking out Lucky Charms marshmallows isn’t your thing, you can buy the marshmallows only to save yourself time and pick through cereal. Charm designs may vary with marshmallows only. Enjoy these fun activities at the end of the leprechaun’s rainbow. Emphasizing kindness and community is so important in the elementary classroom. One way to do this is by writing special notes to one another. 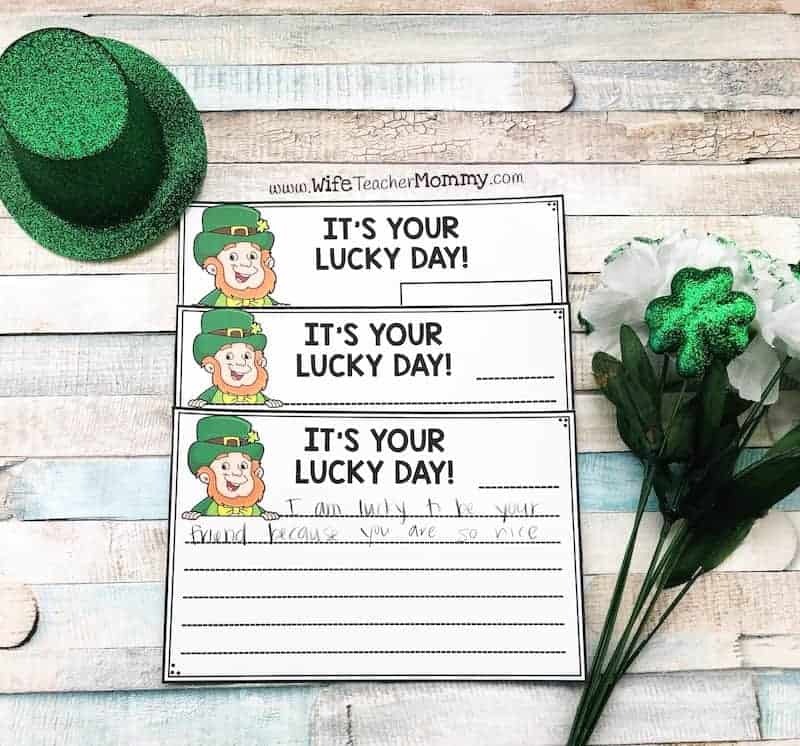 With the Sneaky Leprechaun Writing activities, you’ll get step-by-step lessons to help your children find their own recipient of notes written by “a sneaky leprechaun”. An introductory story, parent letter, student name cards, recording sheet (to keep track of who has whom), 10 pre-written prompts, 4 pre-written report to teachers prompts, differentiated writing pages, reveal cards, and thank you pages are all included! You can see exactly why this made it into our list of St. Patrick’s Day teaching ideas! You can use these lessons all year long with the growing secret student activities writing bundle. Whether it’s back to school, Thanksgiving, Christmas, Valentine’s Day, St. Patrick’s Day, or more, these activities are sure to build community and help your writers build their writing stamina! Read alouds are huge in elementary classrooms. Sharing inspirational books with your students, especially around special holidays, can inspire incredible student writing. S is for Shamrock: an Ireland Alphabet gives an overview of Ireland with an A-Z tour of the country. This book is perfect to share even for more advanced readers. Share the Ireland Alphabet and then have your students write their own alphabet book based on their personal history or culture. They could write a book about the country or state their family is from or a special hobby or interest. Using St. Patrick’s Day and Ireland as inspiration will help your students explore their own creative nonfiction writing. March can be a busy month as you start the last term of the school year. Inevitably, you may have to miss a day or more for illness or trainings. Make sure to utilize March’s sub plans with ELA lessons and behavior and organizational sheets ready to go! The March fill-in-the-blanks (think Mad Libs) reinforce parts of speech and make for a product that will cause giggles galore. Your kids will also enjoy the “How to Catch a Leprechaun” writing activity. There are more than 60 pages of plans to help you in any absence, planned or unplanned. Plans are differentiate for Kindergarten, 1st-2nd grades, and 3rd-5th grades. Check out some of more of the activities below! 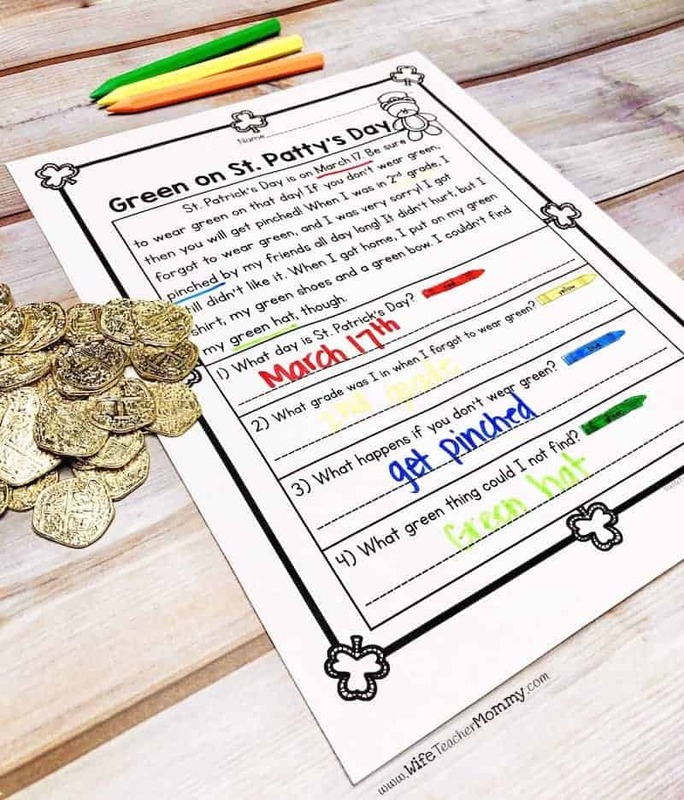 Even if you don’t need a guest teacher for the whole month, these lesson plans contain activities related to St. Patrick’s Day that are simple to use and ready-to-go. Save some time on lessons while you’re in the classroom so you can focus on the fun stuff, building relationships with your students! 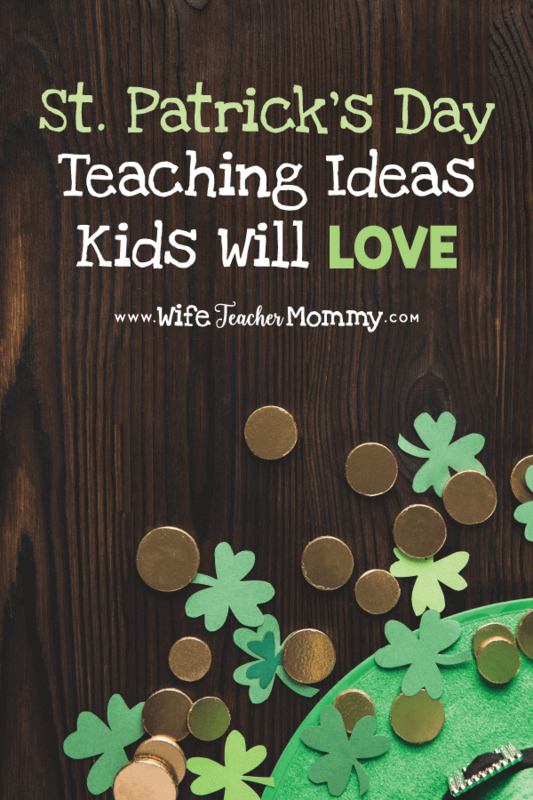 They will love these St. Patrick’s Day teaching ideas. Need more St. Patrick’s Day teaching ideas? Give your students a chance to explore the country of Ireland, where St. Patrick made his home for most of his life. National Geographic Kids, Britannica Kids, and the Smithsonian Institution are online sources for your students to explore and learn more about Ireland. If you are looking for print resources, try Histropedia: The Story of Ireland from Then Until Now or The History of Ireland. Both books use pictures and words appropriate for ages 8-12 and are fantastic companions to explore both historic and current (early 2000s) Ireland. During the month of March, celebrate the holiday with these St. Patrick’s Day teaching ideas kids will love. Try out some ready-made resources, fun to read books, and other activities in March! Be sure to check out all of the St. Patrick’s Day teaching resources mentioned in this post. Check out more ideas on how to integrate holiday and seasonal themes into your classroom here! Love having st Patrick’s ideas! This will be so fun for the kids! I love the rhyming pages, a great way to play with the sounds! Thank you, I can’t wait to try your ideas! I cannot wait to access this!! I haven’t thought about doing any activities for this holiday. Now I will have to. Thanks for the ideas. No problem, Crystal! Thanks for reading! These are great and easy to use! I get overwhelmed looking at ideas for the holidays but these make it easier on me! Thanks for sharing! You’re welcome! So glad it will help you! These are great ideas. Easy to differentiate and super engaging! Glad you like the ideas! 🙂 Thank you! Awesome ideas! I can’t wait to try them out in March! These are all great ideas!! The lucky charms fraction page is wonderful! My third graders are learning about fractions right now, so this would be a perfect way for them to practice what they have learned! Glad you like it, Lychelle! Thank you! The marshmallow fractions look like so much fun!!!! 1. I’m oddly obsessed with MadLibs! 2. Why am I the last to know that you can buy JUST the marshmallows from Lucky Charms cereal??!! I love Mad libs too! And it’s such a game changer, right? Thanks for reading, Tara! I just love anything and everything green, so St. Patrick’s Day is an awesome day in my book. Thanks for the fun activities!!! Glad you liked them, LaTasha! Thank you! These are so perfect for my students. I love having ideas to use for every holiday and the students always enjoy these things. Love all the ready made materials! Such a cute idea! I love all of your stuff! These are amazing! I love your ideas! These are amazing! I love your ideas and how engaging these are for students! Can’t wait to try these with my kinders. Can’t wait to use these ideas this year! Such inspiration, thank you ! Love these simple ways to make learning fun! I try to do something for every holiday, but was coming up short on things for St. Patrick’s Day. This is perfect! You really have some great ideas! Can’t wait to try some out in a few weeks! I love holiday inspired lessons because it gives students more motivation to learn and have fun especially towards the end of the year. Thank you, Tarshica! I hope your kids love them! Oh this will be so fun! This will be so fun! Love the “How to Catch a Leprechaun” writing activity!! Thank you for giving so many great ideas of what myself and my students can do in the classroom next month! I can’t wait!! So glad you like them, Karen! Love these ideas! The fraction activity is my favorite, the kiddos will love eating their marshmallows when done. Love the greater than, less than activity with the marshmellows! These activities look like so much fun and also very educational. Especially the History of Ireland stories! I hope your kids love them! The cereal fractions and comparing numbers will be great for my kids! I love that you found a way to let the kids have fun, but they still are learning something. These are a must for March! Thank you! I love using the holidays in the classroom! Thank you for taking the time to make and share everything with us busy teachers! These ideas sound so awesome, I’m gonna use them in the future! Love great Ideas for Holiday lessons and activities!! Love the Mad Libs! So much fun! Looks like fun and easy to prep! so cute! The kitds are going to love it! Love the idea af looking at Irish history and expanding that to the Art of Ireland. Sometimes the simplest holiday activities are the most fun and engaging! Thanks for sharing! No problem! Thanks for reading! Such fun ideas for a fun holiday! Thanks for the great ideas! I know I will be using some them this year in my classroom. These are great ideas! We talk a lot about comparing numbers in 1st grade so my students will love the math activity. I’m always trying to find creative ideas that go along with the holidays. Thank you! Thank you so much, Rebecca! I love monthly themed activities. St. Patrick’s Day is so fun! My kids did the adding with the lucky charms but halfway through it, they decided eating them would be more fun! I can’t wait to use these ideas next school year!